Today I set up a gallery of my completed quilts. I have completed 19 quilts since I started quilting in 2002. NINE of them were in 2014. That feels great! Of those nine, four were old (two really old) WIPs. I also made progress on some additional WIPs that I hope to finish this year. Here are some of my goals for the year. On the quilting front, first and foremost, I want to cut my # of WIPs in half by the end of the year... taking care to reduce the number on my list quarterly (um... currently 21). I tend to have 6 new ideas for every one quilt I finish. I need to finish more projects and have exciting ideas that are faster to implement. ;-) It felt really good to finish a 2003 and 2006 quilt this year. I think my new oldest project is this baseball quilt I "gave" to my brother for Christmas in 2004 (see below for him modeling the "quilt" back in 2004). It was a wrapped up "see what I'm working on for you... I'm totally gonna finish it soon" kind of gift. Um... soon? I just missed the ten year anniversary of giving that gift. There's a weight that comes with an old project looming over us. I think it makes it feel even better to check it off the list when it's something that old. Of course, I'm also a fan of reassessing whether it's really still important to finish, or if you should decide to sell, give away or re-purpose a project that you really don't still have a passion for. I've decided this project is still important to me, but I will probably have to change my initial plan a little. I'm excited this year to be participating in some Bees and BOMs for fun and skill-building. As of November 2014, I'm a member of the Promise Circle of do. Good Stitches. Our group of this charity bee creates quilts to benefit Threading Hope. Here are the blocks I've made so far for do. Good Stitches. I've also joined the Stash Bee as a member of Hive 1. I have my fabric pull all set for those blocks. I've joined Leah Day for her 2015 quilt along, Dancing Butterflies. 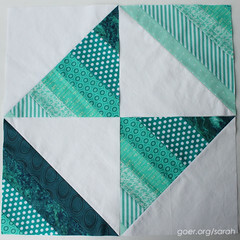 I'm totally inspired by her amazing free-motion quilting and wanted to ensure myself regular practice of my FMQ skills as well as push myself to try new patterns. 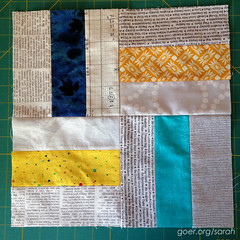 I've signed up for the Patchwork City Metro Area Block of the Month from Intrepid Thread. I saw the purple and green piles of fabric when I was in the shop and asked what they were for... then I couldn't stop thinking about it! 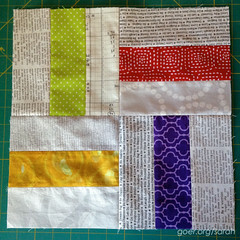 I'm excited about the great color and fun fussy cutting in this project. I'll continue participating in ALYoF and Finish Along to help with monthly goal setting. 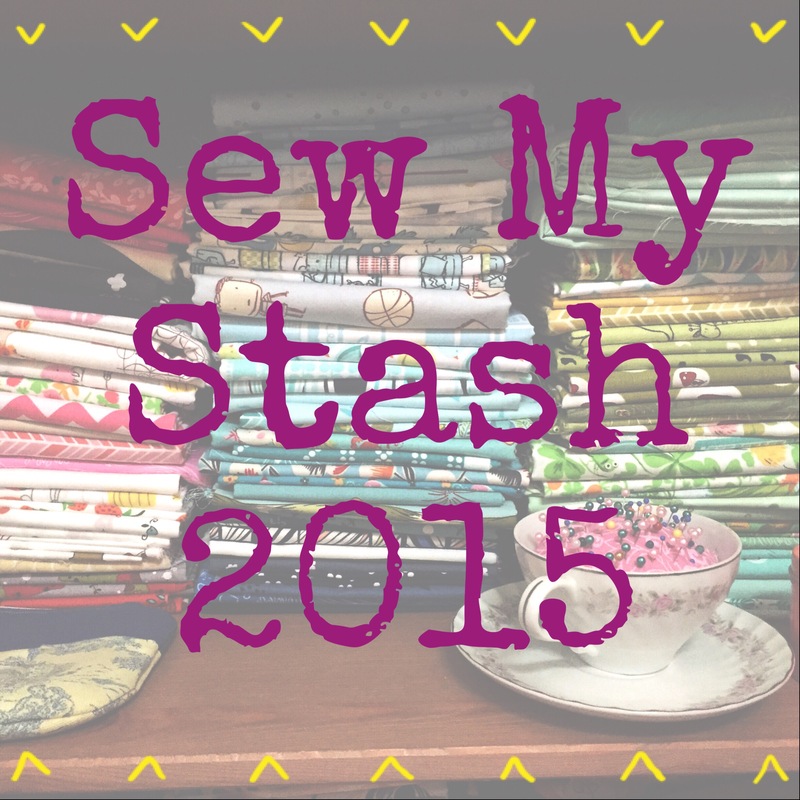 I'm also joining in on #SewMyStash2015 on IG (while I'm not committed to stop buying any fabric, I'm excited to start using more of the stash I've been building for the past year). Some other sewing goals I have are knits and zippers. Not together. I'd like to start with some knit jammies for my kids. And some simple zipper pouches (I made a few in 2009, but that was so long ago!) as a gateway to some more involved bags. On the blog, I'd like to work on getting some more tutorials posted. Part of the reason that I blog is to inspire others and I think this may be just the thing to help do more of that. Posted in Quilting, Sewing. Tags: goals on January 3, 2015 by sarah. Hi Sarah, I REALLY, REALLY hope that one of your goals will be to enter a few of your quilts into the Santa Clara Valley Quilt Association quilt show (March 14th and 15th). Sorry about the shameless promotion! If you still have the candy(?) quilt, I'd love to see that one in person at the show - so colorful! Well, Roberta, that goes without saying! This will be the first year that I have a variety of recently finished quilts to choose from instead of feverishly trying to finish one at the last minute! Candy Shoppe will be one of my submissions for sure. I love it so much! I'll also be joining you with the Dancing Butterflies quilt along, ALYOF and the quarterly finish along. I don't think I'll be doing and BOMs this year - I'm gaining a stack of want to dos that need to be acted upon! I haven't totally decided on the colours yet. I do know the quilt will be for my neice who's turning 5 this spring and she loves brights, so I'm considering each block in a different colour. I am not a brights kinda gal, so this is a step outside my comfort zone! I think it will work well though cause I haven't seen many neutral coloured butterflies...I'm going to need a good neutral/background colour, and I'm leaning towards a grey - which means a shopping trip (wink, wink!) I was hoping 2015 could be a year of using the stash - but I'm allowing for specific fabrics to finish a project and keep those UFOs under control! Bright butterflies sound great to me! I have a project in the queue that isn't really my preferred palette. Maybe that's why I've been sitting on that fabric for SO long. ;-) Happy shopping! Grey sounds like a great complement to the brights! Best wishes in meeting all your goals and in having a ball while you do it Sarah! You are right, there is a "weight" in having unfinished projects. You wrote "I tend to have 6 new ideas for every one quilt I finish. I need to finish more projects and have exciting ideas that are faster to implement. ;-)" I laughed because this is just like me! Thank you. So far so good on what I wanted to accomplish in January. My mantra these days just needs to be "I will not start another project. I will not start another project." It feels really good to be finishing quilts faster than I ever have. i almost wrapped up fabric for my mom and said "this is a future quilt back for you" this past holiday season. glad to know i'm not the only one that thinks this way! and my list of project ideas totally grows faster than the things i complete. Good luck getting through those wips. Maybe the baseball quilt can be done by opening day?